Review: Fighting, medicine shows, and pirates all in one book. There is not much that the Nine Pound Hammer can do to get much better. In this fun and adventurous book, 12-year-old Ray meets giants, pirates, and Ramblers. This is the 1st of the series called The Clockwork Dark. This book would be good for middle school and up, but it is appropriate for younger kids too. Ray has been an orphan for a long time. His father vanished eight years ago. After Ray jumps off a moving train, he finds Conker & Si who work in a medicine show. Ray finds out, while working in the medicine show, that his father was a rambler. With the help of Conker, Si, Buck, and the Pirate Queen, they find the nine-pound hammer, John Henry’s weapon. Ray finds out about the Gog and his machine and the siren, Jolie. After a twist, the evil people get sucked into bottles. The rest of the book gets dangerous with guns, fires and friends lost forever. The Nine Pound Hammer is a great book. The only thing that I thought was disappointing is that this book doesn’t mention Johnny Appleseed (which is on the fold) or the legend of John Henry. Nonetheless, I felt as if I was in the book! With sword-swallowing, fire-eating, and blind sharp shooting, this book is one of the best books I have ever read. The plot to destroy the Gog (or Ray’s former train master), was amazing. The best part in this story is during the medicine show when somebody is able to get out of anything. I was taught that no matter how big a goal is, you can do it if you try. I hope that in the next book in the series they destroy the Gog’s machine, which needs a siren to guide people to the machine so it can get more power. Out of 10 stars, I give it a ‘9’ because of all the exciting adventures Ray and his friends have. But unfortunately everything good must come to an end. This book was amazing. Review written by Adam (6th grade student). We would like to thank Random House for providing a copy of The Nine Pound Hammer for this review. 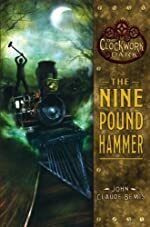 Have you read The Nine Pound Hammer? How would you rate it?